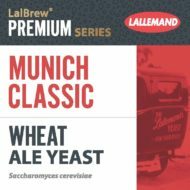 LalBrew® Munich Classic is a Bavarian wheat beer strain that can easily express the spicy and estery aroma profile typical to German wheat beer styles. This strain is simple to use over a wide range of recipe variations and fermentation conditions, making it a great choice for a number of traditional styles of wheat beer. A true top cropping yeast, LalBrew® Munich Classic yeast can be skimmed off the top of classic open fermentation vessels in the traditional manner. Styles brewed with LalBrew® Munich Classic include but are not limited to Weizen/Weissbier, Dunkelweizen and Weizenbock.